his mural Mary McLeod Bethune, completed in 1978 for the Dr. Mary McLeod Bethune Regional Library in Exposition Park, Los Angeles, as well as related preparatory works and ephemera documenting the project—White’s last major artistic endeavor during his lifetime. The four large-scale ink and charcoal compositions at the center of this exhibition are the largest drawings that the artist created and—although they were intended as preparatory works—are exceptional in their level of finish and detail. 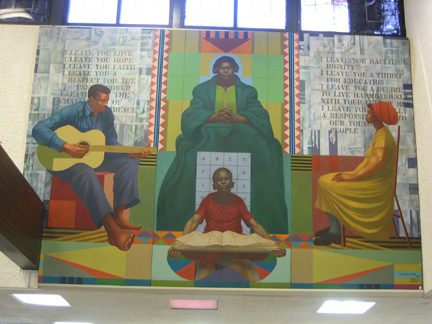 White conceived of the foursome of multigenerational figures that comprises the mural’s composition as a black "family," with the individual figure standing in as a symbolic representation of learning, education, music, or culture. Each is isolated and realized individually in the charcoal studies, in which space is clearly defined to indicate how they fit together in the larger mural, with Bethune—a towering presence wearing flowing robes—at the center. Also on view will be several smaller drawn and painted preparatory works, as well as a range of ephemera and archival documentation related to the project. Seen in conjunction with the critically acclaimed retrospective of White’s work organized by The Art Institute of Chicago and The Museum of Modern Art, New York (on view through January 13, 2019), this focused examination of White’s Mary McLeod Bethune mural will provide a fitting coda to his outsized influence and legacy in American art. 1Kellie Jones, South of Pico: African American Artists in Los Angeles in the 1960s and 1970s (Durham: Duke University Press, 2017), pp. 31–32.